A short history helped by the Rev J.B. Leslies book: Armagh Clergy and Parishes and complied by Rev. David A. Workman. The earliest indications of when a church was in use at Dunany are the records that William de Whythe was Vicar in 1318 and that in 1369 Primate Milo Sweetman indicated its presence in a return to Government. 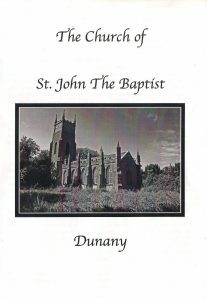 In 1622 it is recorded that the church was “ruinous” and in 1671 it was stated that Dunany was without a church. A subsequent church was built or rebuilt near Dunany House and around two hundred years ago, that church fell into disuse with only the walls then and now remaining standing. The old grave yard of this church is still in use for those who already have relatives buried there. Thus a little background and it was in the walls of that old church that a vestry meet on July 14 1807 when they resolved that a church should built on Windmill hill this church you now see. It was built in 1813 and consecrated on September 15th 1813 with a font been purchased for it in 1827. When the building of the new church was agreed Wallop Brabazon and Andrew Eaton where appointed Church Wardens. Wallop Brabazon conveyed land for the burial ground and 1872 Sir Alan E Bellingham spent over £2000 in securing land and endowing the parish. Mr Edward Roe purchased the Blebe House (Built 1813) and a cost of £705-4s-7½ d.
On entering the porch ahead of your is a tablet of in Loving Memory of Sir Alan E Bellingham and his wife Elizabeth. The tablet notes that the tower was left unfinished and only completed and restored in 1889 by the Rev. William Claypon Bellingham who is their son and then the Rector of Castlebellingham. Stones for the completion for the tower were taken from Clonmore Church in addition to the usually reason, the tower is also used as a reference point for the Ordnance Survey Dublin. On the left of the isle is the organ built by William Elford of Dublin and presented to Dunsany Church by the parishioners and friends of Rev. W. J. Askins for 25 years the Rector of the parish as a Memorial to his life and work. Originally the wind for the organ was hand pumped and the last man to do this regularly was Mr Lesley Oliver. In 1997 an electrical pump was installed. Before that, it was found that some notes where off key. Examination discovered that mice had eaten in some metal bits of the wind pipes. The church mice must have been very hungry to do that. Further up the church there is a tablet to the memory of Ian H. B. England killed in action on 24th September 1940. He was the elder son of Rear Admiral and Mrs England who was buried in the Churchyard. To the left sanctuary there is a plaque in Memory of Susan Caroline (Lily) youngest daughter of Ven. Ambrose Power Archdeacon of Lismore and Widow of Rev Claypon Bellingham. Below that is a grille cross niche set in the wall. Within the niche rest a casket in which the ashes of Susan Bellingham. That grille was made by they Naval Artificers aboard H.M.S. Fisguard Captions by Capt. Hugh England who made the Hymn board for the church. Below the east window is the inscription “To the glory of God and in loving Memory of Alan E. Bellingham and Elizabeth his wife, this window was erected by their children 1891”. The sanctuary railing where installed “ In affectionate remembrance of Mrs. Alan O’Bryen Bellingham aged 78, by her sorrowing relatives. “The Marble Tablet to the left of the east window is a Memorial to Dame Hester Frances Bellingham who died ages 81 and was erected by her nephew Alan O’Bryen Bellingham. To the right of the window is a Memorial to Christiana wife of Alan O’Bryen Bellingham who died in Germany on 23 September 1854 aged 54. The marble tomb centrally based commemorates the last resting place of Alan Edward Bellingham died April 19 1889 and his wife Elizabeth, April 11 1887. Alan was a great benefactor to this church and should always be remembered as such. The inscription around the brass lectern reads : To the Glory of God and in Loving Memory of William Claypon Bellingham of Dunany, Rector of Castlebellingham, who fell asleep Christ at Bagneres De Bigorre, France, and was laid to rest there, October 8 1892, aged 45 years.”Lord I have loved the habitation of thy house, and the place where thine honour dwelleth “. In the 1930s, a dog named sweep use to sleep in the vestry throughout the service but a preacher said that if he ever preached longer than ten minutes, the dog would come out of the vestry and stay in the isle glaring at him until the sermon was over. On the north wall there is a memorial to Alan O’Bryen Bellingham, died September 1859 aged 87 and who’s remains are interned in the old church in Dunany. This tablet was erected by Sophia Bellingham his widow. The font in the baptistery came from Charlestown Church when its contents where been sold off as the old font in Dunany had disintegrated. At a wedding in this church a good but formidable lady came in and sat herself down in the second pew from the front; a pew reserved for the grooms family. An Usher form Scotland, a brigadier, was eventually persuaded to ask her to move to another pew but by then the church was filling up so she got a seat in the Baptistry. At the reception afterwards she was herd to remark – “I had a good seat where I could see everything but I was removed by a big man who put me in a loose box.